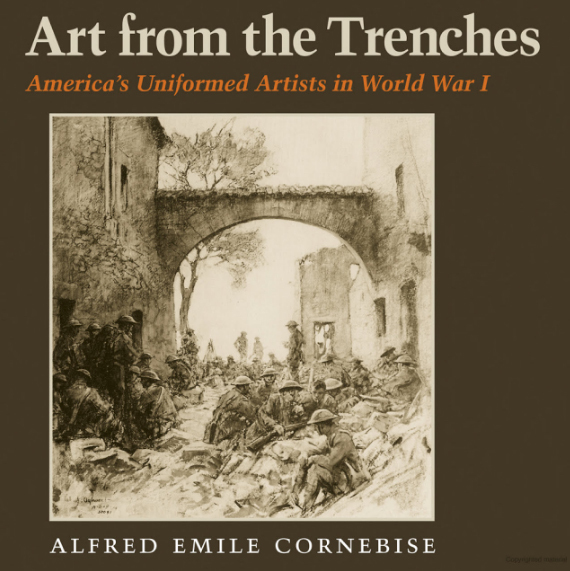 Art from the trenches : America’s uniformed artists in World War I by Alfred Emile Cornebise, Texas A&M University Press, January 26, 2015, pages 19-21, not illustrated. …”The painter of the group who has been described as a “nearly pure artist,” Ernest Clifford Peixotto, was born on October 15, 1869, into a prominent merchant family in San Francisco. He began his artistic career in his native city, studying under Emil Carlsen at the School of Fine Arts at the Mark Hopkins Institute in 1886, remaining there until 1888. He then entered the Atelier Julien in Paris, and there and at the Ateliers de Peinture, Sculpteur, et Dessin he studied with Benjamin Constant, Jules Joseph Lefebvre, and Henri Lucien Doucet, staying three years in all. Beginning in 1890, and for several years to follow, he exhibited pictures at the Paris Salon; in 1895, one of his works, A Woman of Rijsoord, won an honorable mention. Thus, as he once expressed it, as a “mere boy” he encountered France and “the country and its picturesque towns and villages took a strong hold on me.” Later, he spent several summers in Giverny, in Normandy, “and then, as well as since,…have explored every nook of this pretty bit of countryside in all forms of conveyance—bicycle, motor car, and in an open carriage. Peixotto eventually became a member of the Yatch Club of France and, using its facilities, took extended motorboat cruises along the waterways of the nation, taking notes and sketching as he proceeded. The results of these ventures were published in his book, Through the French Provinces, which appeared in 1909. The account reveals the American sophisticate among the peasants, all of whom are depicted as simple, picturesque folk. In Paris, he was a habitue of the outdoor cafes, one of his favorites being the Peche Miraculeuse along the Seine on the western edge of Paris. 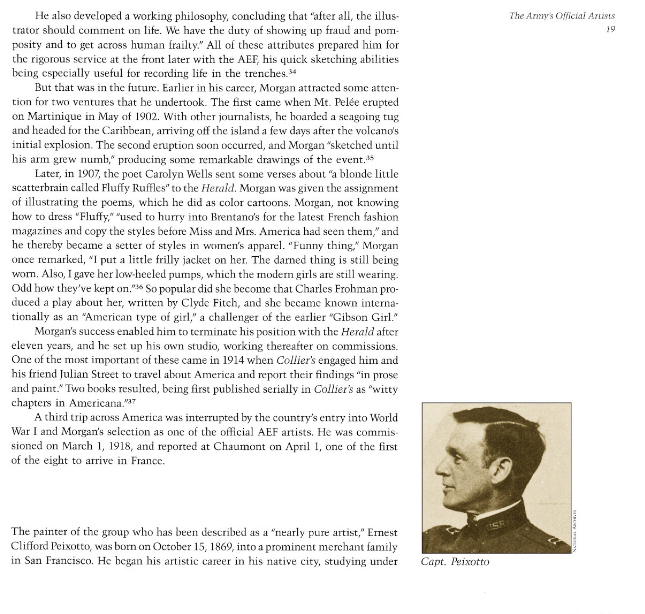 Thus, ever the close observer of France, its customs, and her people, Peixotto enjoyed a leisurely existence, experiencing to the full the pleasures of the Old World which “in its sunset was fair to see,” as Winston Churchill once wrote.” Peixotto would later feel the changed situation in France all the more acutely. For two years, Peixotto lived in New York City, working from 1897 to 1899 for Scribner’s and Harper’s. 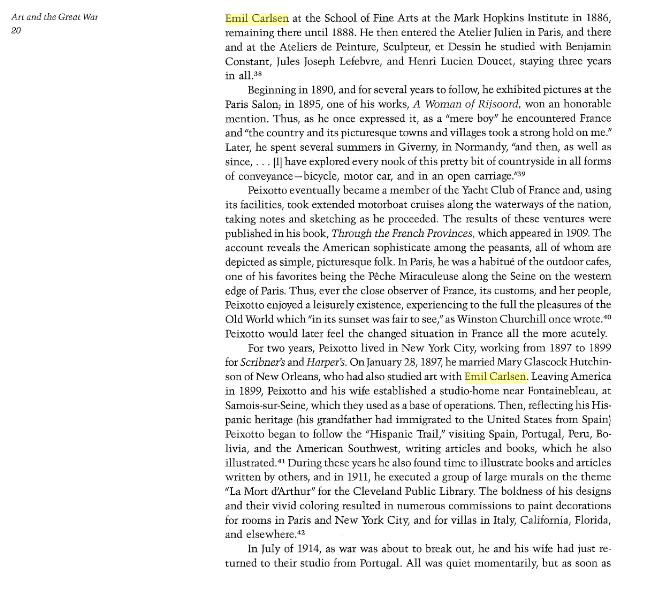 On January 28, 1897, he married Mary Gloscock Hutchinson of New Orleans, who had also studied art with Emil Carlsen. Leaving America in 1899, Peixotto and his wife established a studio-home near Fontainbleau, at Samois-sur-Seine, which they used as a base of operations. Then, reflecting his Hispanic heritage (his grandfather had immigrated to the United States from Spain) Peixotto began to follow the ‘Hispanic Trail,” visiting Spain, Portugal, Peru, Bolivia, and the American Southwest, writing articles and books, which he also illustrated. 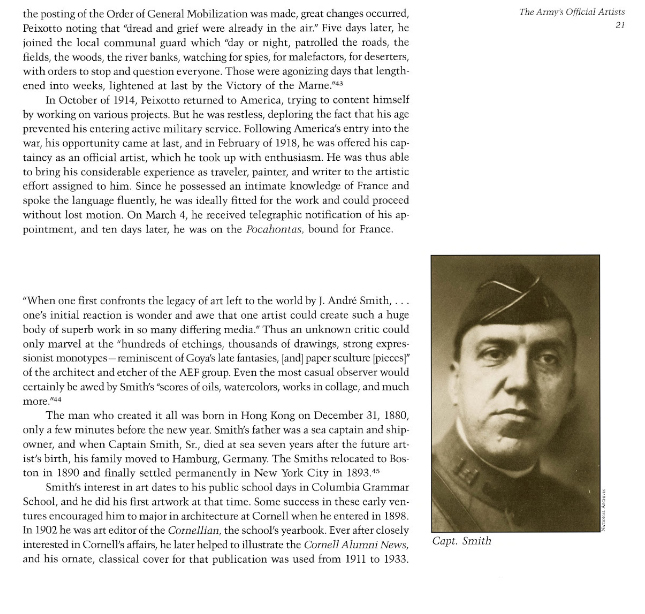 During these years he also found time to illustrate books and articles written by others, and in 1911, he executed a group of large murals on the theme “La Mort d’Arthur” for the Cleveland Public Library. The boldness of his designs and their vivid coloring resulted in numerous commissions to paint decorations for rooms in Paris and New York City, and for villas in Italy, California, Florida, and elsewhere.